I always said I would go back to Colorado. In fact, during a port visit to Florida, when I was in the Navy, I swore I would never live in such a place. Ate those words for breakfast two years later and a heart full of love for a good man from Florida. We go to Colorado to visit, but my heart is here with the family I love. HorsePoorinBigSky- Beautiful barn! Sounds like a good design for the heat and cold. We just built our second Florida barn. Our first was a shedrow and this one is a full sized one because we don't have a separate hay barn. Both have aisles that run north/south. It's a unique design for this area, with the boards a little bit apart from each other to allow air flow. Our coldest temps are in the teens, so it works for us. The left side has boards closer together to keep hay dry. 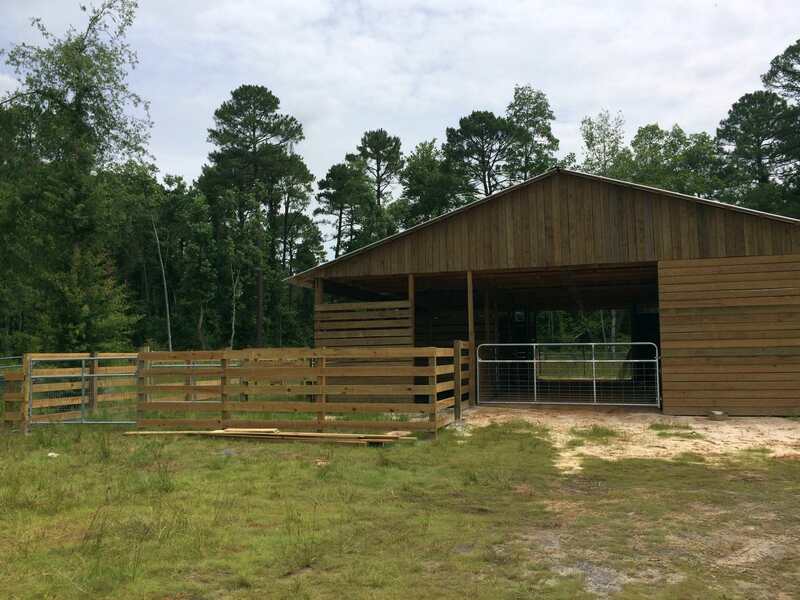 The middle of the right has the tack area. We hope to complete it once we move in. This is the run-in shed for the goat and donkey. 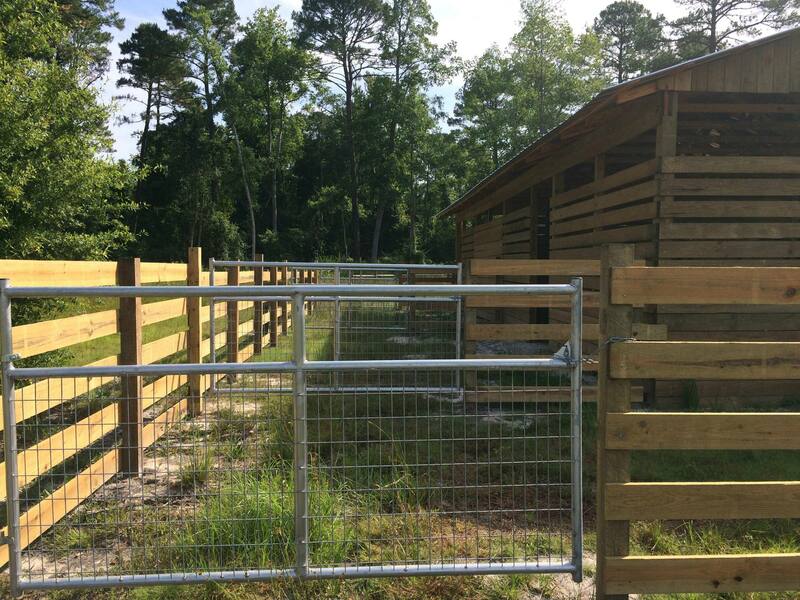 We used cattle panels because goats destroy wovern wire and climb board fencing. The paddocks. The gates line up for bringing animals in and out. They can also secure to the fence for cleaning or paddock maintenance. We built the paddocks and we know the boards should be on the inside, but we just aren't clever enough to make that work. We don't plan on having any crazy horses, though. 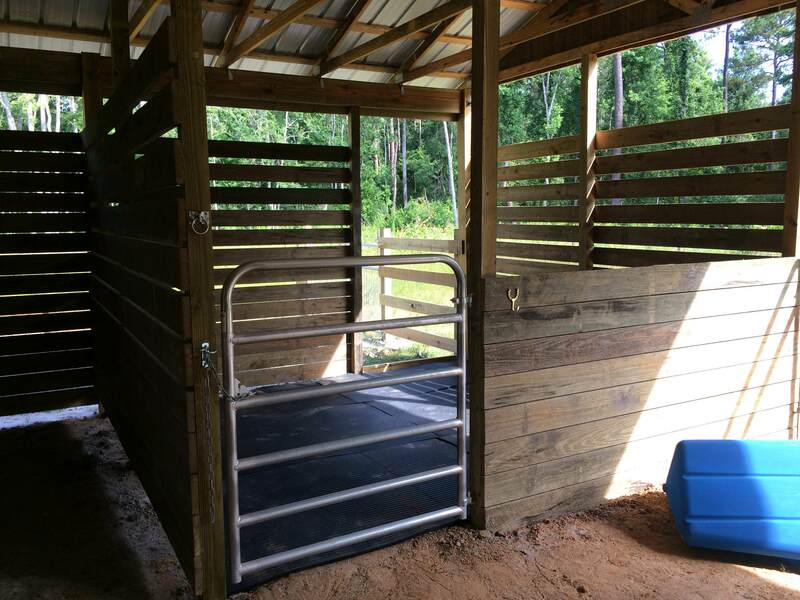 You can't tell from the picture, but there is no way one horse can nip another coming out of their stall. We made the stall doorways at least six feet from the neighboring paddock. I remember that issue from boarding my horse and hated it. The closer together boards are the back of the tack room. The paddocks are wider than they are long. Your eyes aren't deceiving you, the first paddock has five board and the other have four. The first one will be used for the sheep for a few months, so the boards are closer together. It's also to keep a puppy out since the pasture will tie in with the corner of the first paddock. Libby's stall. 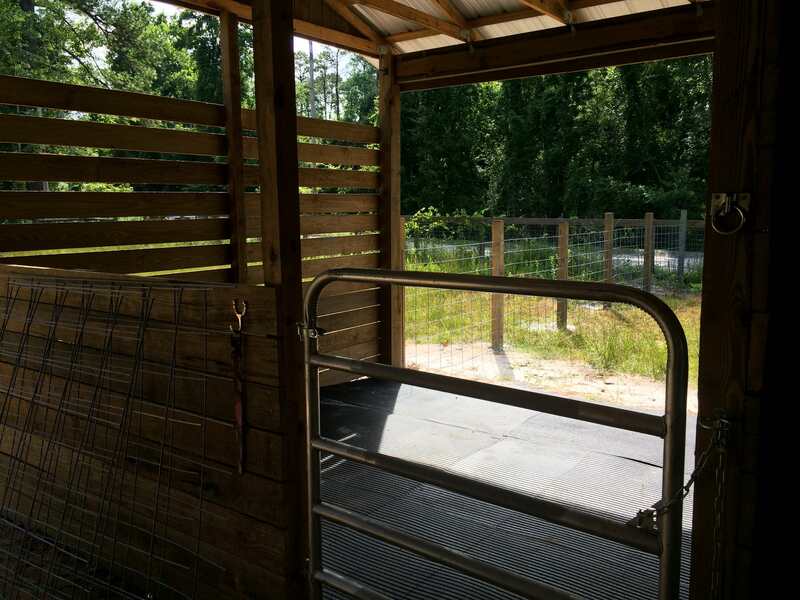 Since she is mostly blind, she gets the same stall in the same relative position in the new barn as the old one. It sounds funny, but I think it will help. We are going to add a few boards on top of the wall because sideways rain can get in. The other two stalls are the same. We will attach the feeder this weekend. That's like our tobacco barns here, LC. They have the gaps in the boards too. 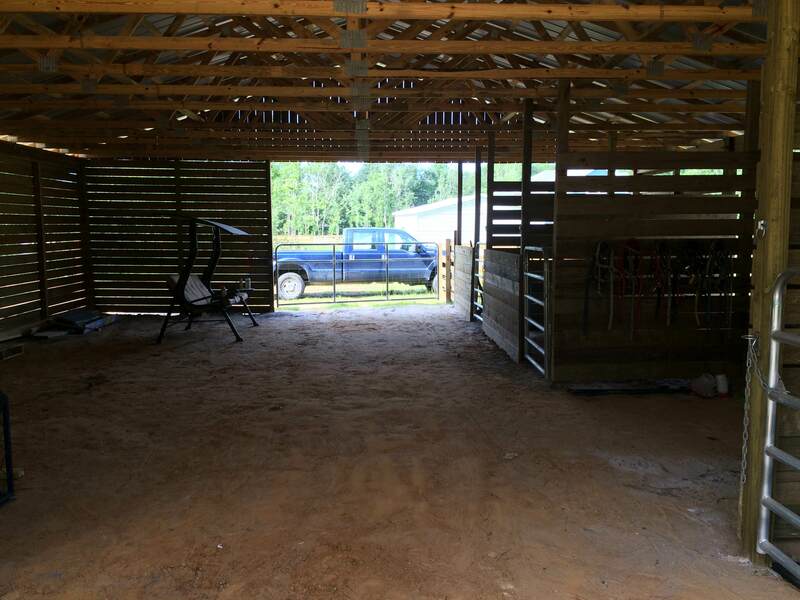 Some people repurpose them for horse barns, but in the winter, they're too breezy (for me.) It would be nice right now though. It looks like you thought everything through before you built. Wow, I love how you set up your barn and paddocks. I'm sure Libby will appreciate the minimal changes to her living area. That was very thoughtful of you. LC - the barn looks great! Been meaning to reply to this for a while now. Mine live out mostly...lots of acres, lots of grass and a big pond. They DO have a barn which is basically a run in that they stand in to get out of the sun. Third pic is of the paddock. Basically its our holding area for anything that needs to be confined, vetted, etc. Im having the landlord replace my tarps with walls so there is shade. Looks good, Queen! I drove past an old horse farm in our area yesterday. They have a big pond and there was one horse swimming around in it, lol! Your setup is great for horses, Queen. They have everything they need. My horse would love a pond. He tried to climb in the water trough when I first got him. But if there's water in a ditch, forget it. He's not going through it--under saddle, at least. Only the yearling minis play in the pond, the others wont go in. As good as it looks out there, its no place for a mini foal apparently. Baby Mojito, who is now Breyer, was bit pretty bad. Required a vet visit and some lancing and draining but he will be fine. We put him and his mom and the expecting donkey in the paddock with another mini gelding to keep them company. That lasted a couple days. They were begging to get outta there yesterday evening. Probably because they had eaten all the grass, and arent used to being on a diet, lol. So, my cowgirl and I were out late making shade in another grassy lot. Ill have to get a pic of it this evening.